Need to make 500 dollars fast? There are hundreds of legit reasons for needing to make an extra $500. Stuff happens. It’s very common for people to have unexpected expenses – anything from a broken down car or an emergency room visit can really put a strain on your wallet. Or maybe your best friend just invited you to a spontaneous trip to Las Vegas and you want to make some extra spending cash. Or maybe money is tight this month. You’ve hit your monthly budget on groceries but, of course, you still need toeat. Whatever your reason for needing an extra $500 dollars, don’t worry. I’m going to show you how to make 500 dollars fast. Some of the methods below will make you $500+ dollars in a single day and some of them will take a little longer. Remember, how much money you make in a day is largely about how hard you work! I’ll show you the tools you need to make money but it’s up to you to do the work. I split up the money-making methods into sections to make it easier for you to find your perfect way to make money. Some people prefer making money while lounging in the front of the TV while other people like doing stuff outdoors. Whatever you prefer, I have a way you can make X dollars. You may want to combine a few of these methods to really take advantage of your money-making potential. Doing all the methods below shouldn’t take more than an hour or two but has the potential to earn you hundreds (possibly even thousands) of dollars. Did you know it’s been estimated that there is about $14 billion dollars of unclaimed money floating around the US? And some of it may be yours! You could have hundreds or thousands dollars of money that is rightfully yours just floating in limbo, waiting to be claimed. You’re probably wondering, how could money be “unclaimed”? Well, every year hundreds of tax refunds don’t get cashed, utility deposits are misplaced, insurance pay-outs are forgotten about, and much more. This pool of unclaimed money just sits around in Federal or State government accounts. You can figure out if you have any unclaimed money in less than a minute. Just go to unclaimed.org and click on every state you’ve ever lived in. That will take you to a state-specific site where you enter your first and last name and it’ll search to see if you are owed any money. Next steps: Head on over to unclaimed.org to see if you have any unclaimed money. For about 3 minutes of work, you can earn yourself a random stock (anything from Sprint to Apple) whose value is anywhere between $2.50 and $200. This is possible through an investing app called Robinhood. They are currently running a sign-up bonus through this link which will give you a completely random stock once you sign up. There are no obligations to actually invest your money once you sign up – so it truly is free money. Once you sign-up you’ll be rewarded a random stock valued between $2.50 and $200. If you are, then I hope you’re using Paribus. They’re a company that automatically helps you get refunds for late deliveries or price drops. Before using Paribus, I didn’t even know that I could get up to $10 in Amazon credit if they deliver a package late. When I first signed up for Paribus, I immediately made $50 and some change. If you’re an avid online shopper, you could be looking at anywhere from $20 to $200 dollars in refunds. Talk about making $100 quickly! So how does Paribus work? Sign up for Paribus here. Using their fancy algorithms, Paribus will automatically check if you’re owed any type of refund. And if so, they will send a claim to the company so you barely have to do any work. Next steps: Take a few minutes to sign-up for Paribus and see if you are owed any money. Similar to Paribus, Trim can help you save money by helping you find subscriptions that you pay for but have long forgotten about. Trim is an app that will go through and find all the subscriptions that you are currently paying for. It’ll list all the subscriptions with the amount you pay monthly or annually. If you find any subscriptions that you no longer want, you can use Trim to easily unsubscribe yourself. When I signed up for Trim, I found a subscription I was paying $5.00/month for that delivered a local newspaper to me. The catch, it was for an address that I no longer lived at! That’s some easy and quick money saved. The best part, of course, is that it’s completely free for you to use! Next steps: Check if you have any pesky monthly bills you’ve forgotten about by signing up for a free Trim account. Want to get paid $3.00 a month for doing absolutely nothing but being an Amazon shopper? Well, now you can, thanks to Shoptracker. It’s an app that’s run by Harris Poll Online – a company that measure’s consumer satisfaction for large brands like Starbucks, Amazon, and iTunes. It anonymously collects your Amazon transaction history, so that it can provide large companies like Amazon with consumer trends, satisfaction, etc. Shoptracker will watch your Amazon transaction history for customer satisfaction, consumer trends, etc. Want to learn more? Read my full Shoptracker review. Next steps: Sign up for Shoptracker to immediately earn $3 plus $3/month forever. I’m sure I’m not alone when I say that when I first come home from work, I like to lounge on the couch and watch Netflix or Hulu for a while. It helps me unwind from a long day of work. What if I told you that you can actually make some money online while watching your favorite show? One of the easiest ways to make money online is through surveys. However, there are a ton of survey sites out there and, to be honest, most of them are pretty crappy. The secret is to know which ones are worth it and which ones aren’t. One of my favorites is SurveyJunkie. Unlike many of their competitors, they focus solely on survey’s which makes them really easy to use. They tell you exactly how many points you’ll earn for a specific survey and HOW long it will take. So you can decide up front if it’s worth taking or not! I’ve found survey’s that pay up to $50! Just signing up and completing your profile will earn you around $2 worth of points. The only downside is that they don’t have a mobile app, so you have to bring out your laptop if you want to earn $500 quickly while watching TV. If you’re into doing survey’s on-the-go or just don’t want to bother with your laptop, I recommend checking out InboxDollars. They have a mobile app that is easy-to-use and provides decent surveys. Next steps: Sign up for SurveyJunkie to earn money fast by doing online surveys. This is one of the fastest ways to make a guaranteed $150. Chase will pay you $150 to open up a checking account with them. You’re probably asking yourself: why would I need a second (or third) checking account? Well, I actually have 4 different checking accounts. One for my incoming paychecks set-up with direct deposit, one for a small emergency fund, one for short-term savings (for larger one-off purchase like a new TV), and one for my monthly bills like internet and Hulu Plus. This helps me keep my finances organized. So, why not open a new checking account AND get paid to do it? It’s a win-win for you. To earn your $150 from opening a Chase checking account, you just have to set-up direct deposit with your new account. Most companies allow you to do that online nowadays, so you could do all this from the comfort of your couch! Next steps: Use this link to get a free $150 for opening a checking account. Every time I’m about to make a large new purchase, I check out what kind of credit card sign-up bonuses I can get. This can be a great way to make money buying things you need to buy anyways. For example, recently we took a trip to Europe and before buying tickets I signed up for the Chase Sapphire Preferred card. Not only is it a great travel card – no foreign transaction fees, baggage delay insurance, trip delay insurance, etc – but it also has a 50,000 point sign-up bonus if you spend $4,000 on it within the first 3 months. 50,000 Chase Ultimate Reward Points is worth $500 or $625 if you redeem the points for travel expenses. So I applied for the card and used it for the whole trip. Boom! $625 towards our next vacation! Not bad. Next steps: Check out Chase Sapphire Preferred credit card to get a $500 sign-up bonus. One of my favorite money hacks is an app called Ibotta. Ibotta is a cash-back app that gives you money back on certain purchases. It’s super easy to use and doesn’t take very much time at all. While this method won’t make you $500 very quickly by itself, combining it with other methods, like the credit card mentioned above, will make you achieve your money goals a lot quicker. Afterward, you search Ibotta for cash-back opportunities on the items you purchased. Snap a pic of the receipt as proof of purchase. My favorite part about Ibotta is that it remembers what deals you’ve used in the past. Which makes every new trip faster and faster since you already have all the deals that you use often, saved. It takes 30 seconds to upload your receipt and make money. I normally do all my grocery shopping and keep my receipts. Usually twice a week I spend a few minutes (while on the couch) seeing if any of the items I bought have cash back deals on Ibotta and then redeem my receipts. It’s a super simple way to save a decent amount of money on your grocery budget every month. Next steps: Sign up for Ibotta now and get a $10 sign-up bonus. Vindale Research is another get-paid-to app that rewards you for doing different things online. One of the ways to get rewarded stood out above the rest. That is, reading emails. Yep, you can earn rewards just by opening emails. Cleaning out my email inbox is something I already do while watching tv. Getting to inbox zero is something I try to do every day to stay organized. Vindale Research will reward you for opening up promotional emails! So why not earn some spending money while clearing out your inbox? Being a part of a focus group can be a fun way to make extra money. You can be paid a $100 or so for an hour of your time – they sometimes even give you free food! But finding local focus groups can be a pain. Finding online focus groups that you qualify is much easier. VIP Voice is a great platform for finding focus groups. They’re a company that will reward you for filling out surveys. If your profile qualifies, you can be invited to do these online focus groups for specific products. Each focus group via VIP Voice will reward you $25 – $100+ depending on the length of the focus group. If doing surveys online isn’t your thing, then you may be more inclined to sell things online to make money. There are so many different things you can sell online. 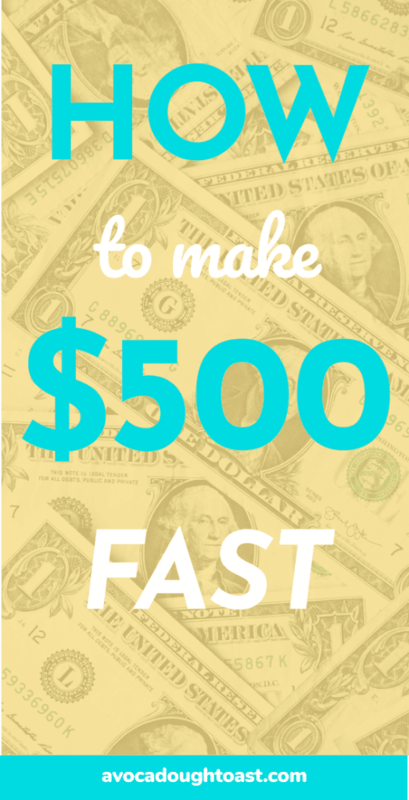 Here are some ways you can make $500 fast. I don’t know about you, but I always seem to have too many clothes in my closet. Most of them I don’t even wear! If you need to make a quick $500, check your closet. Selling your used clothes online is a fast way to make money. The online clothing consignment is booming. More and more people are buying their clothes online. And lots of people don’t want to pay full price for their designer clothes. Next steps: Check out this article on how to sell your clothes online. Gift cards are a safe gift. But admit it, you’d rather have gotten cash. I have a whole pile of gift cards to random restaurants and stores I never go to. Want to make some fast cash from those gift cards? Check out Cardpool.com. Depending on the brand of the gift card, you can get up to 92% of the value of the gift card in cold hard cash or an Amazon gift card! That’s so much better than having useless gift cards laying around the house. Next steps: Exchange your unused gift cards for cash. Selling your photos online at sites like Shutterstock is a great way to make passive income. Take a picture once, upload it, and every time someone downloads your picture you get paid. There are photographers out there that make thousands of dollars a month in royalties from their stock photos. This method works best if you upload photos of places or objects that are in high demand and that not everyone can take photos of. The best part is that once you upload a photo, you don’t have to do anything else! You’ll be earning money from that photo for a long time. Next steps: Sign up for Shutterstock to start making money with your photos. Your closet isn’t the only goldmine in your house. Whenever I move, I like to get rid of as much stuff as possible. That means making some extra money by selling my stuff on Craigslist. Selling stuff on Craigslist will earn you money and declutter your house. It’s a win-win. Sometimes the only thing you have to sell is your time and skills. Luckily, it’s easy to make money online with your skills. There are so many different ways to pick up online side-jobs to earn a quick buck. Freelance writing is a great side hustle. Whether you’re a professional writer, a student or a stay-at-home mom trying to make an extra $500, anybody can turn their writing skills into a profitable side job. Websites are always looking for people to write content for their site and many of them pay anywhere from $50 to $500+ dollars for a blog post. Usually, online writers get paid per word. You can command an even higher price per word if you have specific knowledge that not many other people have. Getting started writing for money is confusing. There’s so much information online that it can be overwhelming. Elna Cain is a freelance writer who is making thousands each month with her writing skills. To help other people break into freelance writing, she has created a killer course that walks you through all the steps required to make your first $1,000 by writing online. I highly recommend checking out the course if you’re interested in making money by writing. Next steps: Get started making money online with your writing skills by taking the writeto1k course. Teaching English online is a lucrative side hustle. You can make anywhere between $14-$22 dollars per hour from home by tutoring kids. If you don’t meet those qualifications, you still might be able to find other ESL teaching opportunities. Making $5 a gig doesn’t sound like much money at all. But if you can do hundreds of gigs a month (and you can), those 5 dollar bills sure add up. Fivver is a gig platform where users sell their goods or services for $5 a pop. Check out their Fun & Lifestyle category for some more inspiration. Of course, if you want to make the most money with the least amount of effort, you should sell a digital product that you can sell over and over again. For example, a 28-day keto meal plan is something you only have to do once but can keep on selling! Another secret is to list your basic service at $5 but add tons of optional add-ons to increase the value. If you’re doing logo designs, you can charge $5 for a logo and then another $5 or $10 to do any revisions. Remember, it’s all about providing value. Next steps: Decide what you want to sell on Fivver and sign up. In fact, there are so many different methods of making money that writing them all out would fill a book! So here are just a few of my favorite ways to point you in the right direction. When we go out on the weekends, we always use Uber or Lyft. There’s really nothing better than not having to worry about finding parking or who’s going to be the designated driver. Of course, someone actually has to do the driving. Driving for Uber or Lyft is a good side-hustle. The secret is to ride during the popular times – weekend nights and holidays. That’s the best time to make extra money. If you enjoy driving around and socializing with people, driving for Uber or Lyft could be right for you. Next steps: Sign up for Uber here or Lyft here. If you enjoy driving but don’t like talking to people, delivering food may be your best option. Services like UberEats and DoorDash allow you to order food to be delivered from restaurants and food places that don’t normally deliver. These services always need drivers to do the actual deliveries. You can make upwards of $12 delivering food! You can always sign up for UberEats and DoorDash to maximize your profits. Next steps: Sign for UberEats and DoorDash to start delivering food for money. I recently stumbled upon this sweet app called Seated. They give you $10 to $50 in rewards every time you make a reservation at your favorite restaurant. If you’re an avid restauranteur, this is a must-have app. Even $10 in rewards for eating out will pay for an extra drink or two at dinner! Babysitting is one of the first “jobs” many of us get paid for. It can still be a lucrative side-job for many of you. If kids are too much to handle, you could also pet-sit. The best part about babysitting is that once the kids are occupied or asleep, you can work on any of the online methods of making money to maximize your time. The hardest part about babysitting is getting started. Finding a parent in need can be difficult. Luckily there’s an easy solution. SitterCity is an online platform that connects parents in need of a sitter with people who want to make extra money babysitting. They even offer opportunities to pet-sit. Next steps: Sign up for SitterCity to get started making money babysitting. What’s better than getting paid to exercise and hang out with cute dogs? Rover.com lets you apply to be a dog sitter or dog walker. You’ll be paid to watch dogs or take them for a walk. You can make a cool few thousand dollars a month if you have the time and patience to walk dogs every day. Next steps: Get started making money by walking dogs. Another classic. When I was a kid, my neighbor would pay me $20 to mow his lawn once a week during the summer. If you enjoy working in your yard. Why not get paid to do yard work for your neighbors? You can make good money if you promise weekly yard maintenance. If the summer heat isn’t your thing, you can always wait until winter and shovel driveways or even get paid to hang Christmas lights. Every winter, one of my friend makes a decent amount of side money by hanging people’s Christmas lights. It can be a difficult and dangerous job and you get paid for that. Next steps: Check out your local Craigslist or just start by knocking on doors. How’s the saying go? One man’s junk is another man’s treasure? If you don’t want to sell your stuff online, you can always have a good old yard sale. This is a great way to start your summer off – extra money and a spring cleaning! Next steps: Talk to your neighbors to coordinate a block yard sale. If you made it to here, you should have plenty of ideas on how to make a quick $500. But I want you to remember that in the end, the only person limiting your income is yourself and your mindset. There are countless ways to make money. The only way you can fail at making an extra $500 is to give up. If you stop trying every time you fail, you’re not going to make it. Don’t give up. Keep trying until you make it. 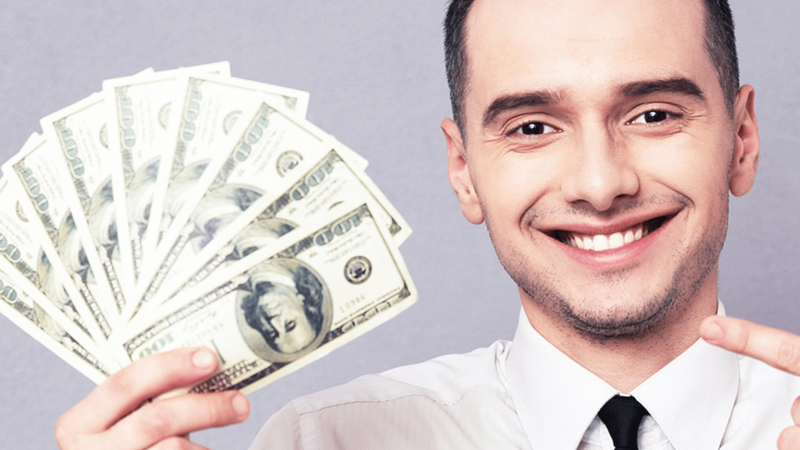 Have you made an extra $500 fast? I’d love to hear any strategies I missed. I was wondering how to do the Netflix one? That’s the only one that didn’t give instructions. So the headline “How to make money while watching Netflix” is a section title for the number of different methods that follow it. You can try out any of the methods that are listed below it for example doing surveys, reading emails, etc. I hope that clears up any confusion!